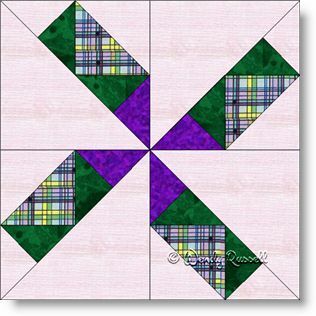 The Turning Stars quilt block is a four patch block that, to me, is misnamed. I think it looks more like a pinwheel than a star, but then that is just me. It is kind of a neat block as each of the four quadrants are constructed as two halves of a large square, once you put all the small components together. The resultant pinwheel shape in the completed block is a bit of a surprise. This is nothing difficult about this quilt block's construction and it does introduce you to using quarter square triangles in one half of each of the four units that make up the quilt block. The sample quilts illustrated show a straight setting, with blocks side by side, as well as an on point setting where the blocks are constructed on the diagonal and, in this case, also separated by sashing strips.